The roads are expected to be busy in France and Switzerland. Three German autobahns are shut for road works. Austria should be quiet but the spring-like weather is already turning. Rush hour traffic this afternoon on the A8 Munich-Stuttgart. Bison Fute has issued a red warning (very busy but not gridlock) for traffic heading for the French Alps tomorrow – and an orange warning (busy) for traffic heading back. Fingers crossed however because last week’s predicted heavy traffic failed to materialise. No warnings are given for Sunday. Meanwhile, in Germany three autobahns are shut for road works according to the ADAC. The eastbound A6 at Kaiserslautern (Saturday-Sunday 22:00-18:00). 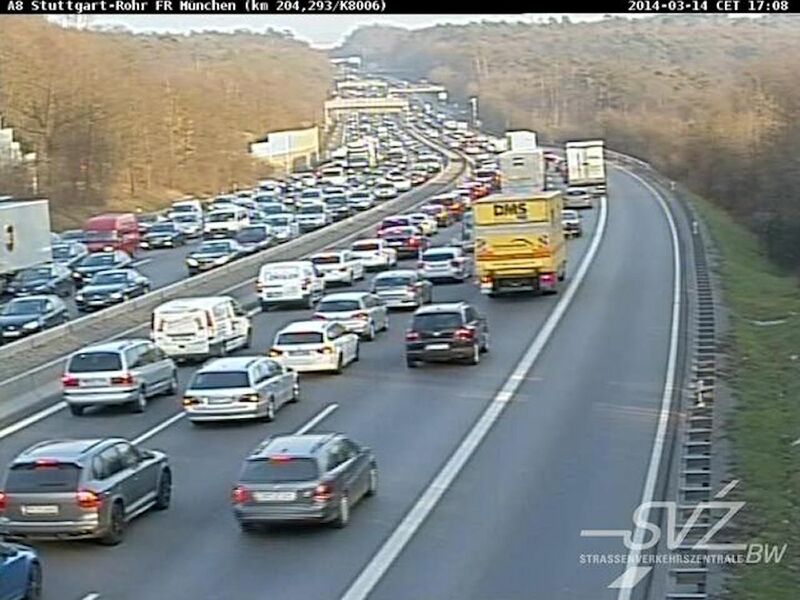 A46 in both directions at Dusseldorf (Saturday-Monday 20:00-05:00). A99 Munich ring road, from west to north anticlockwise (Saturday-Monday, 23:00-07:30). In general, traffic should be at normal levels but inevitably the roads to and from the Alps will be busier than usual (A93, A95), plus it’s the end of half term in Hamburg. The final weekend of the Geneva motorshow in Switzerland will mean heavy traffic on the A1 to Lausanne but, as it’s the last weekend of half term holidays, the worst delays are likely on the roads around the major ski resorts, Basel border crossings and Furka/Lotschberg car trains. The worst times according to TCS (German only) will be all day Saturday 08:00-17:00 and Sunday 15:00-18:00. In Austria however, no major delays are expected on major routes though direct access routes around the ski resorts will be busy says OAMTC. Finally, the spring-like weather is already on the turn in northern Europe and is expected to head south over the weekend, probably as far as the Alps.